Reliever placed on DL with what could be a long-term injury. 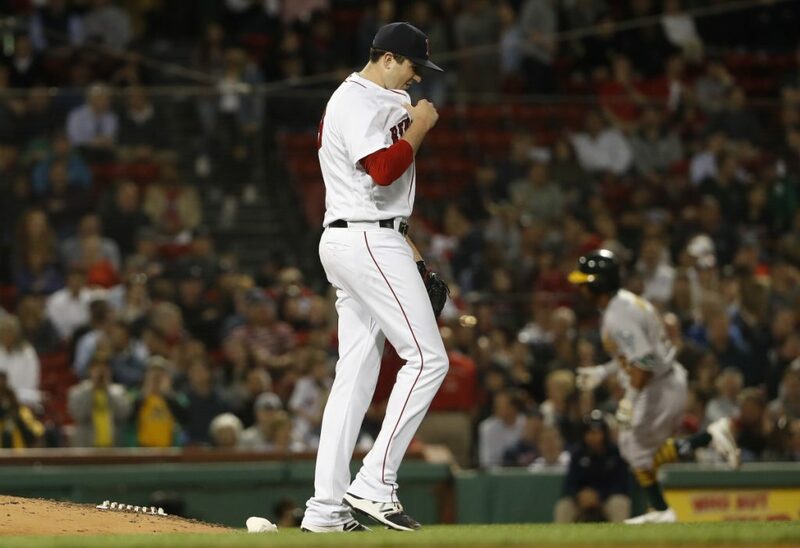 BOSTON (AP) — Red Sox pitcher Carson Smith dislocated his pitching shoulder during a tantrum and went on the 10-day disabled list Tuesday, an injury Boston said could be major. The 28-year-old right-hander was hurt when he threw his glove in the dugout after leaving Monday night’s 6-5 loss to Oakland. He entered with the Red Sox trailing 5-4 in the eighth, allowed Khris Davis’ leadoff home run, then retired three straight batters. Brian Johnson relieved to start the ninth. Left-hander Bobby Poyner was recalled up from Triple-A Pawtucket. Poyner is 1-0 with a 2.25 ERA in seven games and eight innings with the Red Sox this season. Smith was acquired from Seattle before the 2016 season to be a set-up man for closer Craig Kimbrel but has been limited to 29 games for the Red Sox. He had Tommy John surgery on May 24, 2016, and returned to appear in eight games last September. Davis’ homer was the only run allowed by Smith in his last six games and 4 2/3 innings. He was 1-1 with a 3.77 ERA in 18 games and 14 1/3 innings this season. Smith said he tosses his glove regularly with fellow pitcher Joe Kelly.